WhatWhereGalway What do you want to do this week? February is the month of balls here in Galway, or so it seems. We told you before about the Valentine’s Ball in the G Hotel and now there are 2 more nice venues to dance and dance and dance. The society An Cumann Staire, organizes the NUIG Arts Ball every year in February and it is the highlight of the student calender and has been the largest society ball in Ireland with a record 1,700 students in attendance in 2011. This year the venue is at the Salthill Hotel, with 4 well known bands the Arts Ball 2014. Tickets from 30 euros (afters). All proceeds of the Arts Ball will be going towards COPE Galway. This is a classic formal dress ball so please dress well or you may not get in, and leave the runners at home on the window ledge. The second ball is organized by NUIG Italian Society, and everybody can join (no need to be a student, just wear your mask). The masquerade celebrates the festival of Carnevale in Venice. It is held in aid of a different charity every year and it’s always an amazing night of colour, music and fun. 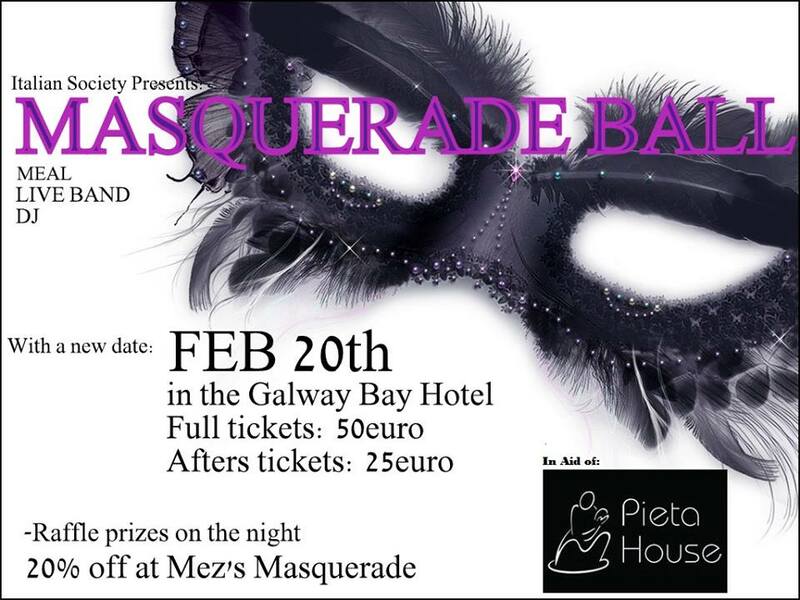 This year the ball is being held in the Galway Bay Hotel on the 20th February in aid of Pieta House. The initial date was also Thursday 13th but it has been moved to the 20th, so more time to prepare your outfit! Galway “City of the Tribes” is possibly the cloudiest place in Ireland and may seem the most unlikely places to have an Astronomy Club. But the city is a vibrant hub of Astronomical research that has become a centre of excellence the areas Astrophysics, Astrochemistry, Pulsars and Star formation. On February 1st 2014 members of the public are invited to a special event dedicated to unravelling the mysteries of the Universe being held at the Westwood House Hotel. “City of Stars” is the theme for the Galway Astronomy Festival with an emphasis on how our exploration of the Cosmos has inspired communities and cultures in our city that would not otherwise do so; to think about the Universe. 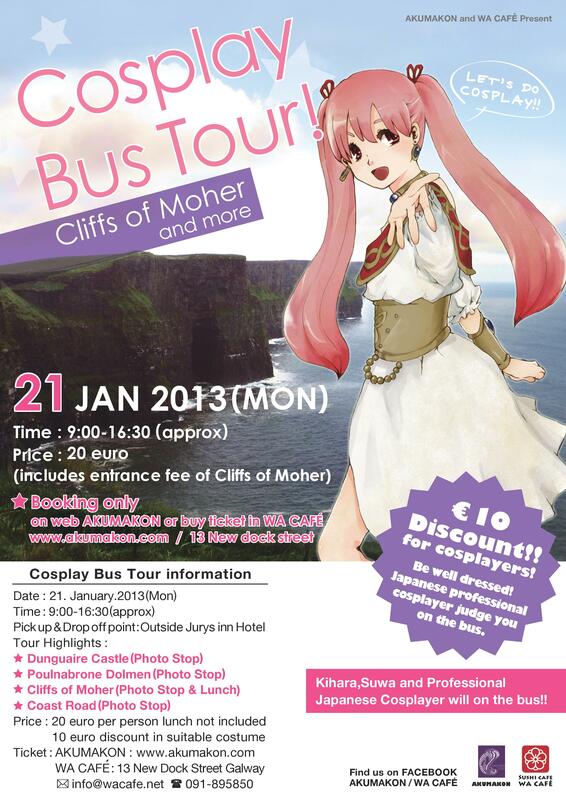 Akumakon is an Anime, Manga and Japanese Culture event that happens in, NUI Galway this weekend (from Friday 17th to Sunday 19th of January). In 2013, Akumakon experienced its most successful year to date (over 700 attendees) and raised over €1,500 for charities. Citadel: Directed by Ciaran Foy in 2012. Synopsis: An agoraphobic father teams up with a renegade priest to save his daughter from the clutches of a gang of twisted feral children who committed an act of violence against his family years earlier. The Conjuring: Directed by James Wan (Saw, Insidious). Synopsis: Paranormal investigators Ed and Lorraine Warren work to help a family terrorized by a dark presence in their farmhouse. 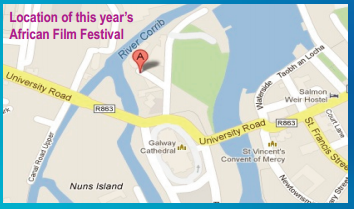 During the Mystery Screening, in The Roisin Dubh, a selection of Irish Horror films will be shown. This is going to be the 6th edition of the African Film Festival, always around the 25th of May, Africa Day, to celebrate African diversity and to highlight its cultural potential. Cassim is a young Muslim man who works in his father’s fabric shop in Johannesburg. However, Cassim wants to be a stand-up comedian, which his father disproves of. When he gets a gig at a local bar, he has to find a way of keeping it a secret. Akin and Mary meet for the first time at an airport where they accidentally swap their phones. This leads to a destination mix up after they receive one another’s text regarding a travel destination. Consequently, Akin ends up travelling to where Mary is supposed to go and vice versa. Neither knows about the swap until they have reached their opposite destinations and “the phone” stops ringing (In Mary’s case) and “Won’t stop ringing” (In Akins’s case). As a result of the phone swap, they agree to help carry out each other’s missions, armed with the information and data on each other’s phone. The program is quite long for just 3 days, check it here. Good movies away from the commercial circuit for this weekend, dealing with comedy, drama, social affairs, stories for children and for adults.